Principal drawing of the system. Start with finding a location to install the pump unit in an Upright position. Install and fix with the 2 screws enclosed with the pump unit. Install the lift switch. Connect with the multicoloured electrical wire and run its connector to the pump unit and plug in. Attach the Black wire from the connector to Ground(- negative). On the InstaLift-switch each pin is marked with the colour that the each wire out of the multicolour wire from the pump unit shall be hooked onto. Use fuse 20 Amp @ 12 volt. Find the location for the cylinder. It can be installed with the hydraulic fitting both Up or Down! Use a 4mm drill to pre-drill the fixing holes for the cylinders brackets. Use the enclosed screws to fix the cylinders brackets. Run the hydraulic hose from the pump unit to the cylinders. Leave ample room for the hose to slowly turn around corners to avoid the hose from folding and closing the oil to pass freely. Now fill the system with the Biodegradable oil supplied with the pump unit. 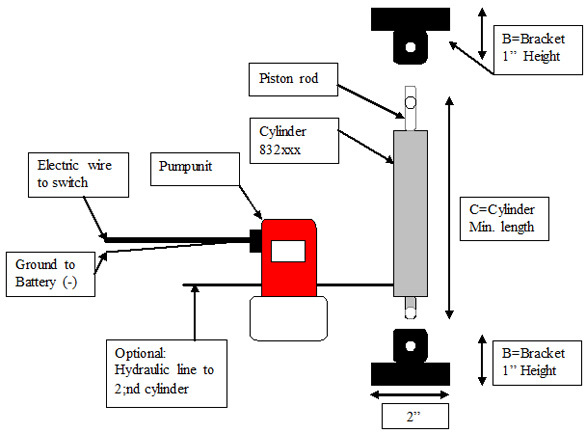 After filling: Run the cylinder to its maximum out position by pushing the switch ”Up/Out”. Wait for about 10 seconds to allow trapped air form one bubble to more easily be ventilated out when pushing the “Down” switch, allowing the air to be ventilated out inside the oil-reservoir. Repeat this twice with about 1 minute in between. In installation with very long hydraulic hoses between pump unit and the cylinder it might be necessary to ventilate the air out from the system manually. Ventilate manually by holding the cylinder, still connected to the hydraulic hose, with the hydraulic fitting upwards. Run it to maximum out and wait for more the 10 seconds before you push “Down” button and push the cylinder to its minimum. Repeat if necessary.